TODAY in Nigeria, the sleaze daily being discovered by the anti-corruption agencies and the Office of Auditor-General of the Federation are frightening. But the citizens are no longer surprised. They expect more news of such pillage from the past administrations, especially by officials of former President Goodluck Jonathan administration. But the revelations coming from the so-called Panama Papers from the files belonging to Panamanian law firm, Mossack Fonseca, by International Consortium of Investigative Journalists (ICIJ) have added a new dimension to how corrupt public officers will go to hide their ill-gotten money in safe havens. However, before the revelation of corruption under the last administration by the Economic and Financial Crimes Commission (EFCC), a continental body, African Union (AU)/United Nations Economic Commission for Africa’s (UNECA) High-Level Panel on Illicit Financial Flows (IFFs), chaired by former South African President Thabo Mbeki, had few years ago, as part of its sensitisation and advocacy campaigns, visited Nigeria and other top African countries affected by corruption and other modes of illicit financial flows. When the elder-statesman visited Jonathan, he presented damning reports on how IFFs might lead Nigeria into financial calamity. But the administration was not swayed. It later increased the tempo of pillage until the twilight of its tenure. Concerned about the increasing dimension of IFFs, the Mbeki panel late last year, again gathered stakeholders in Nairobi, Kenya and Accra, Ghana on another round of sensitisations on how to implement recommendations from the reports submitted to a summit of African Union (AU) Heads of States and Governments. The workshop was organised by ECA, African Capacity Building Foundation (ACBF), Open Society Initiative for West Africa (OSIWA) and others to consider ways of implementing the findings of the panel and seek global cooperation. The former South African President and his colleagues on the panel lamented that IFFs were becoming huge and increasing in dimensions from the initial $854 billion that disappeared from the continent between 1970 and 2008. “That is why we are asking political leaders in East Africa, West and Central Africa, North Africa and South Africa regions to be responsible for their nations.” Mbeki called on governments to establish strong regulations in tax collection and customs. At the meetings, President Muhammadu Buhari’s anti-graft stance and plans to recover stolen funds earned the panel’s backing. However, former South African president, who noted that he had not followed what Buhari’s administration was doing, said the body would support the Federal Government’s plans to recover stolen assets, adding that the plan would encourage other African governments, if it succeeds. It was surprising that few weeks after the meetings ended, there were reactions to revelations on pillage by actors under the former administration took over the greatest percentage of the nation’s mass media. A former judge of International Court of Justice (ICJ) at The Hague Prince Bola Ajibola, who seldom comment on national issues, was forced to speak on the alleged theft of N1.34 trillion by 55 privileged Nigerians. A former Chief Justice of Nigeria, and Nigeria’s ex-Ambassador to the United Nations (UN), Prof. Ibrahim Gambari, were also among several other Nigerians and civil rights organisations, who declared support for the President’s anti-corruption war after the multiple revelations of the sleaze deals. The two elder statesmen, acting under the auspices of the Centre for Diplomacy, Democracy and Development, in a statement in Abuja, urged Buhari to tackle corruption. Also, a former Central Bank of Nigeria Governor, Prof. Charles Soludo, accused the former President of running the apex bank the way former Ugandan President, Idi Amin, ran his country. He said it was regrettable that in spite of the CBN’s statutory independence, it ended up being a victim of high-wire politics under the administration. The United States (U.S.) Secretary of State, John Kerry, among other global leaders, also gave Buhari’s anti-corruption campaign a pass mark. At the World Economic Forum, in Davos, Switzerland, Kerry referred to Buhari’s fight against corruption in Nigeria and how individuals kept money meant for arms deal. The U.S. Secretary of State said: “It has been reported that over 50 people, including government officials stole over $9 billion in Nigeria”. 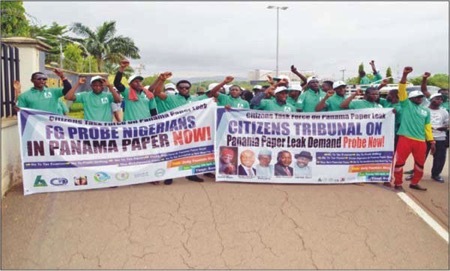 To add to the discovery of corrupt practices, reports from the leaks from the files belonging to Panamanian law firm indicted, among other global leaders, Senate President Bukola Saraki and other Nigerians for running secret offshore firms. Others allegedly implicated are ex-Senate President David Mark, Saraki’s wife, former Delta State Governor James Ibori, Laolu Saraki, Obi Asika and Olufela Ibidapo. The report further confirmed Nigeria’s not dignifying top position in the web of the continent’s IFFs since most African leaders linked so far with the Panama files are Nigerian leaders and officials. There were strong indications during the week that the EFCC has started probing the allegations against indicted Nigerians. A top source, who spoke in confidence with The Nation, said the EFCC has already obtained a copy of the Panama papers and it was studying the files. The source said: “We are studying all the documents and definitely, we will investigate the allegations against all the Nigerians implicated in the Panama papers. Speaking on the leak Mbeki said: “Over the past few days, there has been a furore in the global community regarding reports on ‘the Panama Papers’, an enormous leak of more than 11 million documents, which are said to date back up to four decades and are allegedly connected to a Panama law firm. According to ICIJ, this firm has, in all that time and possibly longer, helped establish secret shell companies and offshore accounts for the rich and the powerful globally. On an even graver note, data from these documents show that that the firm worked with more than 14,000 banks, law firms, company incorporators and other middlemen to set up companies, foundations and trusts for customers. In a time such as this when the issue of curbing IFFs, brought on by practices such as tax evasion and the use of Tax Havens, is one of Africa’s priorities, the release of these Panama Papers is most welcome. The information released in the Panama Papers, Mbeki noted, “thus far strongly confirms the findings in the HLP report”. The Mbeki panel, which includes nine other members, was established by Joint AU and ECA Conference of Ministers of Finance, Planning and Economic Development and inaugurated in February 2012 in Johannesburg, South Africa with the aim of determining the nature and patterns of illicit financial outflows; establishing the level of such outflows from the continent; assessing the complex and long-term implications of IFF, consulting and sensitising African governments and other stakeholders, including development partners, on the scale of the issue and finally, proposing policies and mobilising support for practices that would reverse these outflows. The Mbeki panel was inaugurated based on a report from Global Financial Integrity (GFI), a Washington D.C. based research and advocacy organisation, that Africa lost about $854 billion in illicit financial outflows from 1970 through 2008. Aside the GFI report claiming that data for a 39-year range from 1970 to 2008 shows that an approximately $854 billion was pilfered away, at also claimed that total illicit outflows might be as high as $1.8 trillion. Of this, sub-Saharan African countries experienced the bulk of IFFs with the West and Central African region posting the largest outflow number. Nigeria tops four other countries with $89.5 billion as the highest outflow measured. It is followed by Egypt ($70.5 billion), Algeria ($25.7 billion), Morocco ($25 billion), and South Africa ($24.9 billion). The GFI report also asserted that such outflows from the entire region outpaced official development assistance going into the region at a ratio of at least 2 to 1; and growing at an average rate of 11.9 per cent per year. However, at the conclusion of its continental-wide consultation with stakeholders, which ended with participants from West and Central African countries in Ghana, Mbeki himself joined others in seeking concerted and broad-based actions through continental-wide political will, participation of every citizen, global partnership and cooperation among others in fighting the menace of IFF. However, the support received by the panel could be linked to its being established by African organs themselves – the AU and ECA. Since the 1990s, perception-based measures have been influential in determining levels of corruption on the continent. The fourth ECA African Governance Review report argues that such measures misrepresent realities in Africa and are misguiding policymakers and investors. Nigerian Ambassador and Permanent Representative to AU and UNECA, Paul Lolo, was the only Nigerian government official and diplomat to speak on IFFs when the news broke that Nigeria topped a report on IFFs. In an interview, he said though he was yet to study such report, he warned that people should be careful about quoting data owing to the method of gathering them. He said people should not forget that Nigeria might feature prominently in a data of IFFs’ nature because of the population when compare with the population and size of other countries on the continent. Lolo added that the Federal Government was tackling some issues that might have been raised in the IFF report through its transparency and accountability programmes. The envoy noted the experience of African dictators like the late President Mobutu of Zaire, who owned four mansions in Switzerland but was denied visa to visit and stay in them at the twilight of his life time. The Mbeki panel found that in some African countries, the institutional architecture for responding to IFFs was at best uneven or, as in several key instances, non-existent. It cited lack of transparency, secrecy and the difficulty of obtaining information and systematic data remain key challenges across the board. “Even where the institutional set-up is elaborate and extensive, as is the case with Nigeria, we remain concerned about the effectiveness of the relevant institutions, including the lack of cooperation and coherent operations among the various agencies. We also learned of concerns about retaining skilled people in public service in Africa due to the large gap in remuneration between the public and private sectors. We heard reports that large corporations had attempted to recruit skilled accountants and lawyers who had worked for government on cases related to IFFs,” the panel said. The panel mentioned some of the related institutions in Nigeria as including: Nigerian Ministry of Finance, Central Bank of Nigeria, EFCC, Independent Corrupt Practices and other related Commission (EFCC), Federal Inland Revenue Service, Nigeria Custom Service, Nigeria Drug Law Enforcement Agency, Nigeria Extractive Industry Transparency Initiative, Nigeria’s Code of Conduct Bureau, Special Control Unit against Money Laundering, Nigerian Financial Intelligence Unit and Nigeria Police. The panel said in Nigeria, capacity exists within the Customs to monitor oil exports, but the authority to monitor them and other exports was transferred by the Federal Government to other agencies. The report indicated that despite the various institutions and their efforts aimed at curbing IFFs and related problems, the magnitude of the challenges experienced by these institutions overwhelm their implementation capacities. The Mbeki panel’s report claimed that its studies showed that Nigeria and the Democratic Republic of Congo, which have huge oil/gas and mineral sectors, were quite vulnerable to the IFFs in their mono-economies, especially in extractive industries. However, the panel noted that the inability of Nigeria and others to establish the precise quantities of their natural resources that are exported serves to aggravate poor record-keeping and data collection -well-known bane of development planning on the continent. However, the link of Nigerian extractive industry to IFFs by Mbeki and the consequences of effect on IFFs had been supported by a claim by Edo State Governor Adams Oshiomhole that a minister under Jonathan allegedly stole over $6 billion. The panel’s fear over the implication of unaccountable management of revenue has been further strengthened by Nigeria’s woes in the area of dwindling revenue from crude oil sales, the discovery of Shale oil, fall of oil price in the global market and abandonment of the country’s oil by the U.S. and South Africa. Also recent data by the National Bureau of Statistics (NBS) showed that a decline was recorded in revenue accruable to the Federal Government from the petroleum sector, as the country’s earnings from crude oil export dropped to N5.271 trillion for the nine month period, January to September 2015. ‘’The reason is not far-fetched: Appropriated funds have mostly ended up in the pockets of a few looters. When the money meant to construct roads are looted, the end result is that the roads are not built and the people suffer and even die in avoidable road accidents. When the money meant to provide electricity is looted, we all are perpetually sentenced to darkness. When the money meant for healthcare is pocketed by a few, we are unable to reduce maternal and infant mortality. These are the costs of corruption,” the minister said. Also, the Commissioner for Economic Affairs, AU Commission Dr. Anthony Mothae Maruping, told The Nation in Accra, that Africa has streamlined its endeavours in the Agenda 2063 and they must be fulfilled through domestic resources mobilisation. The Executive Secretary of an AU organ, African Capacity-Building Foundation (ACBF), Prof. Emmanuel Nnadozie, one of the key organisers of the Kenya and Ghana workshops on IFFs, said the AU’s agency would contribute to the validation of the programme document under preparation to tackle IFFs. “ACBF wishes to play a critical role in coordinating and building capacity of countries in their efforts to stem IFFs. “It will also support joint activities with partners such as sub regional workshops, implement capacity needs assessment initiatives to curb IFFs, design appropriate capacity development intervention, and contribute to the efforts for resources mobilisation,” he said. Prof. Fabian Ajogwu, a Senior Advocate of Nigeria (SAN) and head, Kenna Partners law firm, said one of the things that must be done is “working towards harmonising our laws, to be able to block these loopholes, to be able to block the issues of theft, to be able to deal with the issues of corruption and also to be able to tackle the issues of under-declaration and non-declaration of resource trading”. The lawyer, who has authored several commercial law books and handled high profile national and international cases with emphasis on aviation, defence, energy and financial services sectors, however, warned: “First of all, states need to articulate the steps that must be taken in imposing documents. It is not for short-stock angle debate. It is a big problem. Approaches should be articulated on how to deal with the problem. It is not ‘one cap fits it all’; different states have different problems on how their funds are moved out illicitly. Once we find that out, the HLP needs to be localised now that the report has been received. In terms of the largest illicit fund areas, it is non-declaration or under declaration of resource trading. You may call it crude theft, mineral theft and inter-companies arrangement that deprive the state of what is due. Now, having said that, the question may then be, how do you deal with the issue of corruption? To the Chairman, Presidential Advisory Committee on Anti-corruption, Prof. Itse Sagay, the implementation of the Administration of Criminal Justice Act (ACJA) 2015, would ensure speedy trial and effectively eliminate existing challenges to criminal justice in the country. Sagay assured that the era, where looters of public funds manipulate the criminal justice system through delay, was over with the introduction of the ACJA 2015. He said a thorough understanding of the provisions of the Act and its effectively application by trial judges would allow the criminal justice system function to the benefit of all. 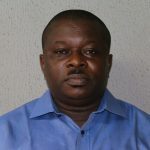 The EFCC’s Director of Operations, Mr. Olaolu Adegbite, in an interview with The Nation said fighting IFFs was topical in the operations of the agency and the Federal Government’s anti-corruption agenda. He said the issue of IFFs was not new to the EFCC since the commission is saddled with the obligations of enforcing laws relating to economic and financial crimes. He emphasised that the agency was committed to tackling illicit financial crimes since they were at the root of Nigeria’s and African nations’ financial resources flows to other continents, poverty and under-development. To the Executive Secretary, West Africa Tax Administration Forum (WATAF) Babatunde Oladapo: “The inability to implement the recommendations of the HLP on IFFs in timeous manner has cost African countries a lot. One can imagine a situation in Africa where massive flow of illicit money out of the continent is facilitated by a global shadow financial system comprising tax havens, secrecy jurisdictions, disguised corporations, anonymous trust accounts, fake foundations and money laundering techniques. However, with the unfolding discovery about Panama Papers, the Federal Government must again go to the drawing board on the fight against corruption and IFFs from criminal and commercial perspectives. The discovery has further strengthened the claims in the Mbeki report about Nigeria’s topmost position in the hierarchy of the continent’s IFFs’ scourge. Olajuwon, Bola Raji is a graduate of mass communication as well as master’s degree holder in managerial psychology. I am a development journalist of 22 years’ experience, working with The Nation newspaper in Lagos, Nigeria, as an Assistant Editor. I have bias for challenges facing Africa and believe in the need for critical intervention. My duties as a journalist are to change the society, to inform, educate and enlighten, among others, as an affecting agent as well as contribute to the development of good governance, participatory democracy, equity and rule of law. Through my write-ups, I have been exposed to international training through sponsorship for conferences. Through these platforms, I have been involved in advocacy programme through writing of focused stories, interviews and features on critical issues affecting the continent and the global community. I am 50 years-old, married and have three children.